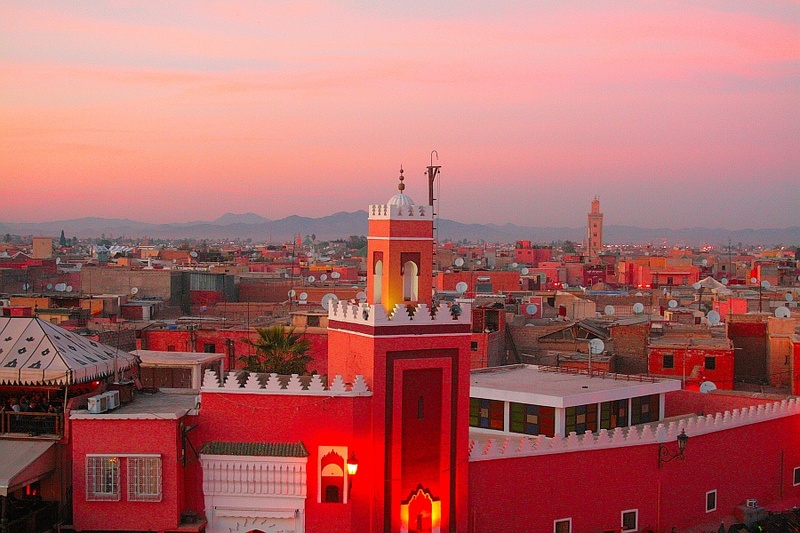 Marrakech was founded over 1000 years ago in 1062. In the 12th century red walls were constructed to fortify and protect the city. 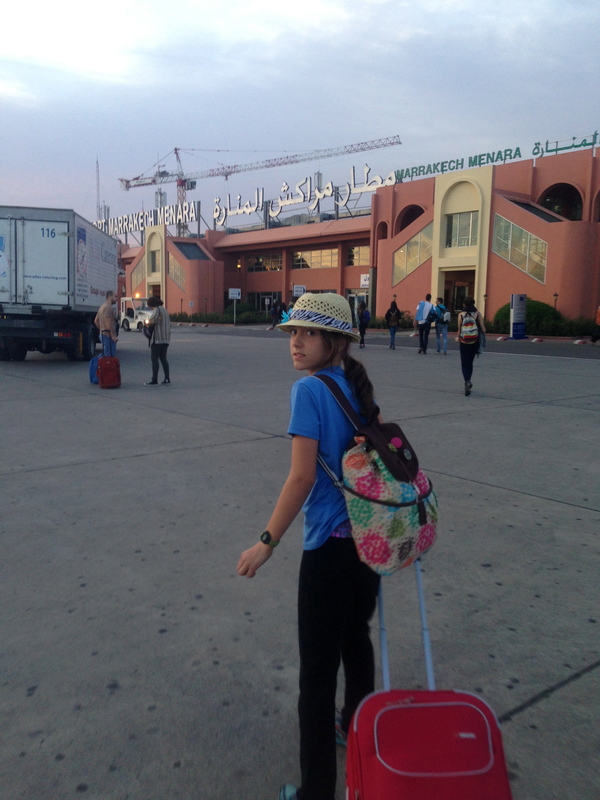 Team Kezmoh started the day at 3:30 am to make our flight from Sevilla to Marrakech. Sky and Savannah jumped out of bed, excited to begin the next chapter of our adventure. We travelled during their spring break from school. 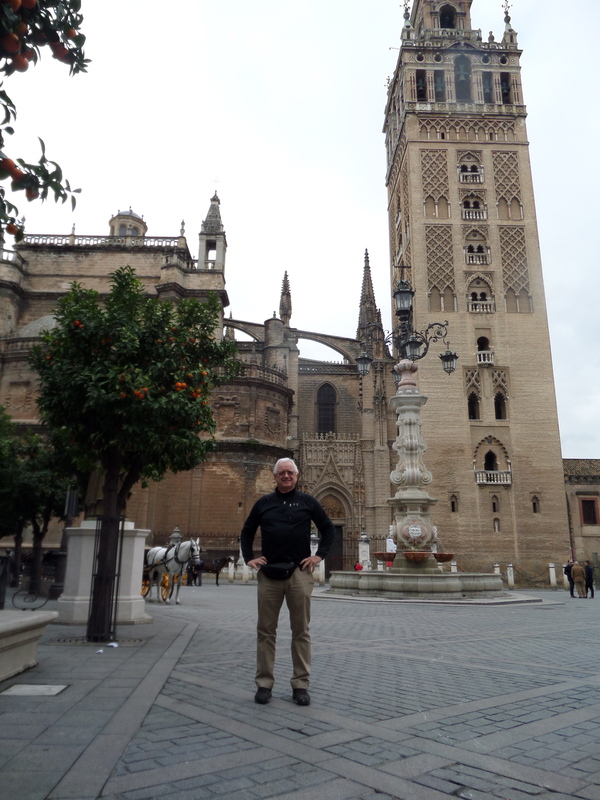 We knew that we would miss Semana Santa, (Holy Week or Easter Week) so we planned a couple of extra days in Sevilla on the way home from Africa. We easily found a taxi outside of the airport and we arrived after a quick 10 minute drive. Luckily we had the phone number for our hotel and our driver called ahead for directions. 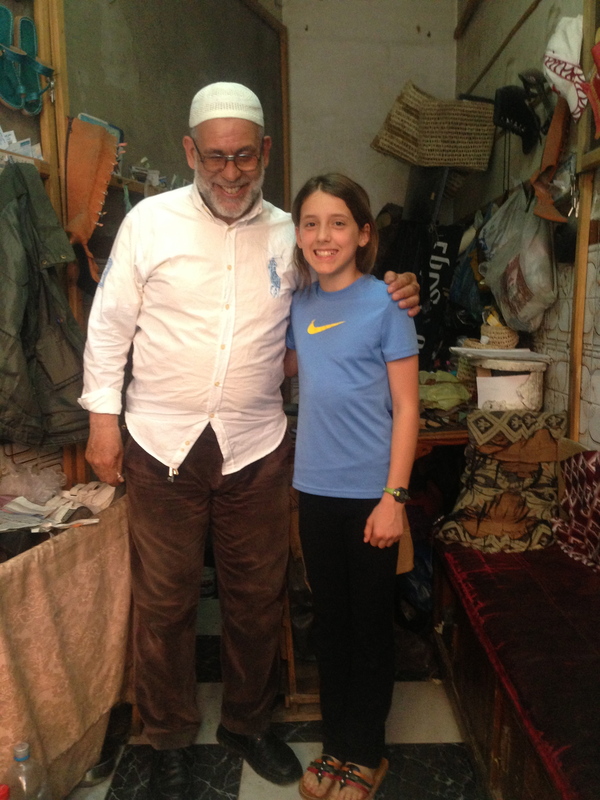 When we arrived he pointed down a narrow alleyway and said in French, “I think your hotel is that way…” A moment before we set off in the wrong direction, Youseff, our host at Riad Jardin Secret appeared. He had thankfully come out to meet us. He greeted us warmly and unlocked a small unmarked door in the rampart (wall around the city). He led us down a tiny passageway to the entrance of our riad. I was very relieved to see the sign outside the unassuming door. The door gave no hint of what we would find inside. 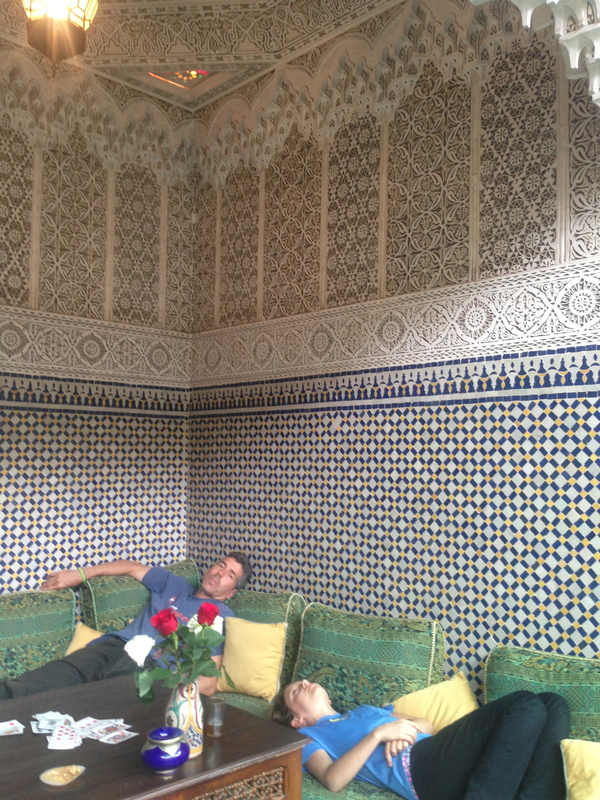 Youseff led us into the cool tranquility past an indoor garden and sat us down in a beautiful parlor. He hurried back with sweet, hot mint tea and gorgeous pastries. Sky and Savannah enjoying some mint tea. 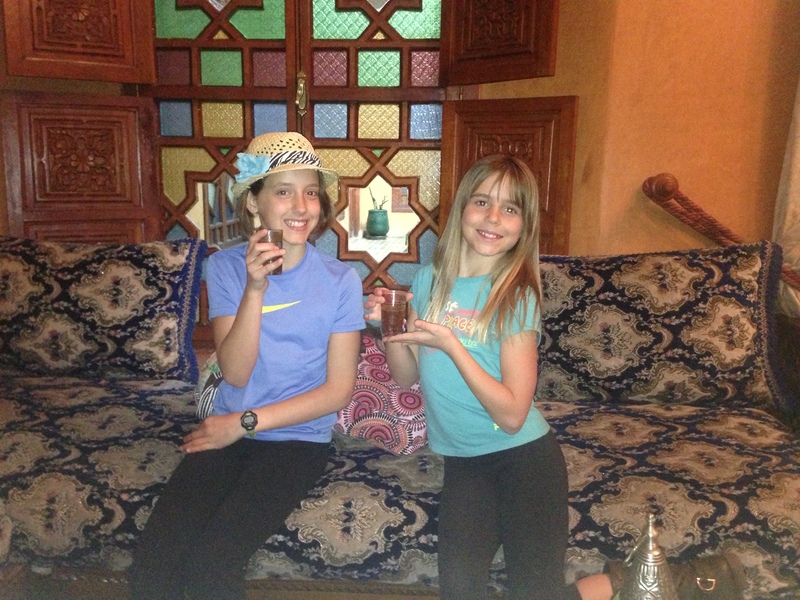 We learned that a riad is a traditional Moroccan house or palace with an interior courtyard or garden. There is generally a water feature in the central courtyard that acts a natural air conditioner. 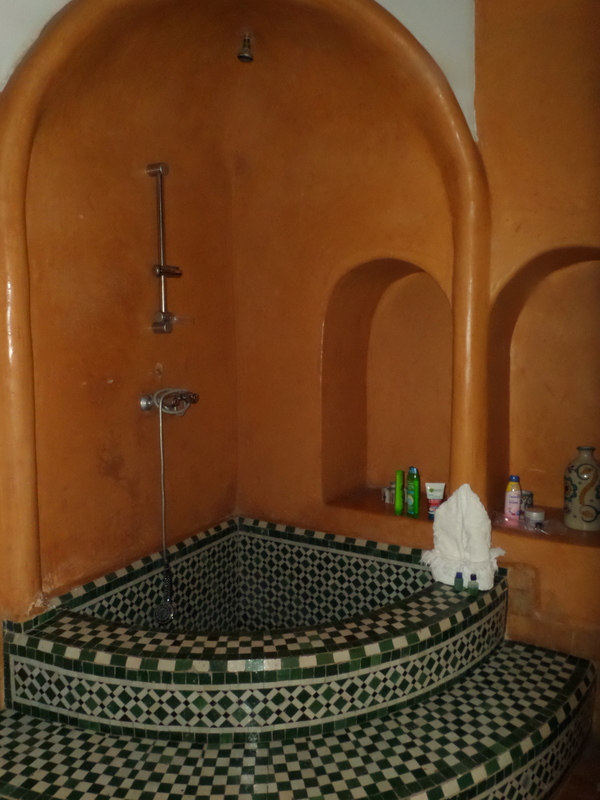 Warm air entering the riad is cooled by channeling it over the water. The heat rises and leaves via the open air courtyard. 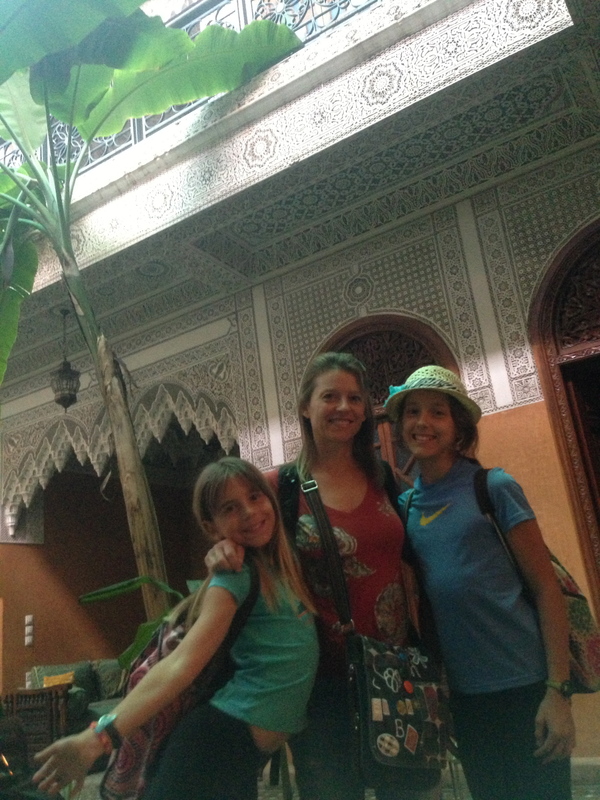 We noticed a significant temperature drop as soon as we entered the riad. 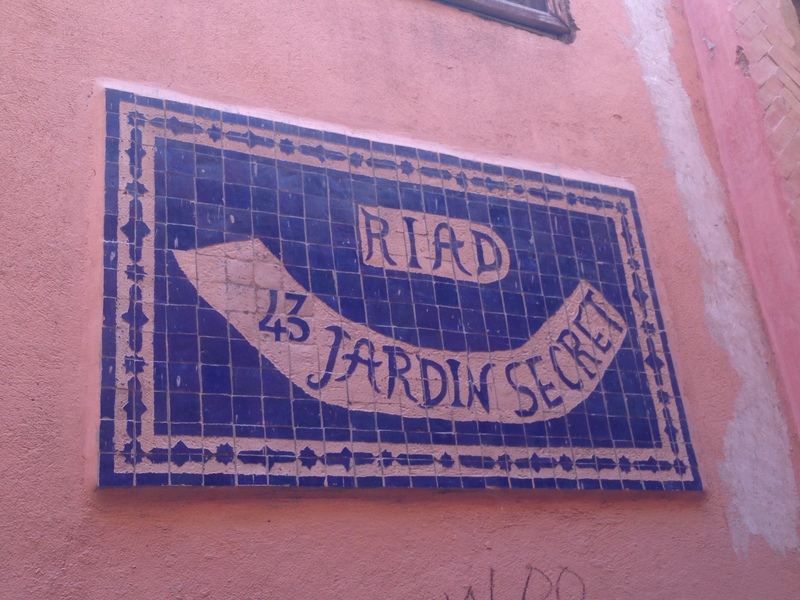 Ryad is the Arabic word for garden so technically our riad was called “Garden Secret Garden”. 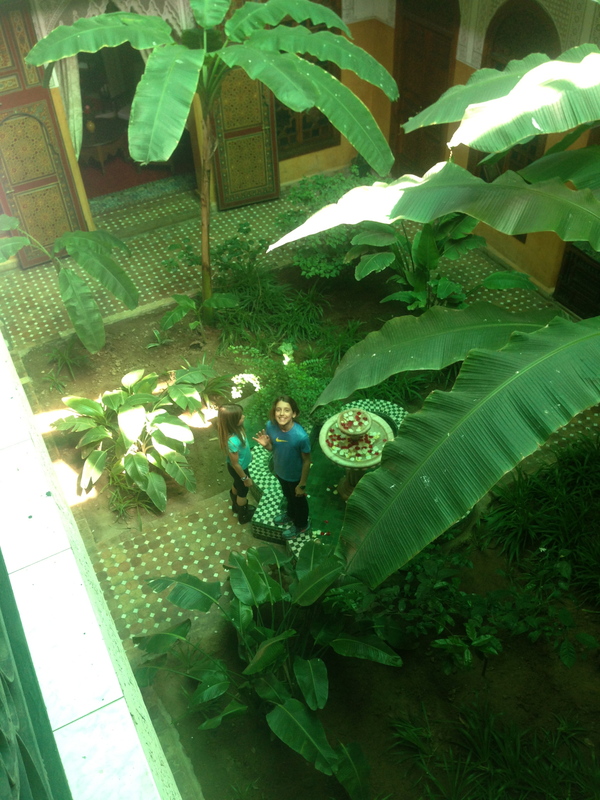 Riad Jardin Secret is a very typical, traditional Moroccan palace. It was built in the 19th century and has been beautifully restored. It was designed to protect the privacy of the family who would have lived there. There are no exterior windows to the city. All of the windows face to inner gardens and courtyards. This design principle also supports the Islamic tradition of privacy for women. The inner walls are constructed of a shiny tadelakt plaster. Most of the courtyard walls are adorned with colorful zellige tiles. One of the lovely lounge areas around the courtyard. 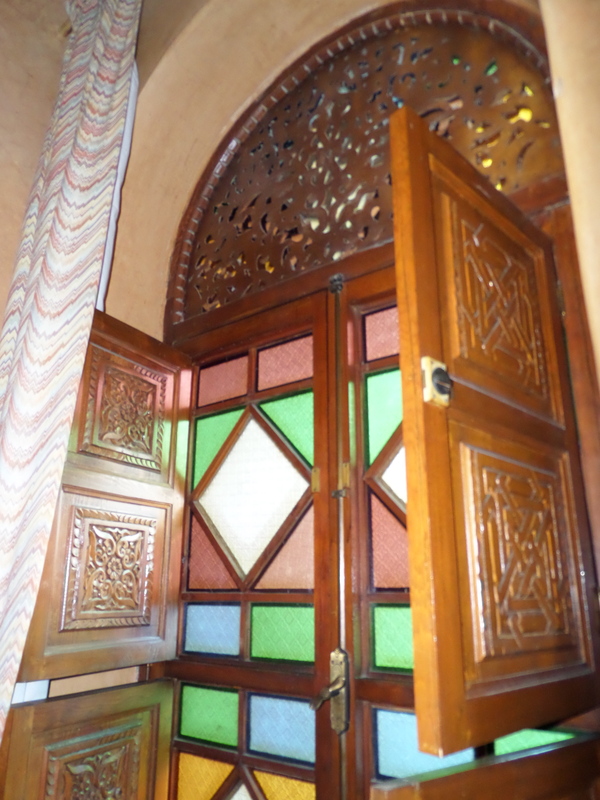 Notice the traditional zellige tiles and intricate carvings. There are 8 rooms, each opulently decorated. We were told that Jardin Secret was once the home to an aristocratic family who also owned the home next door. One wife would have lived here with her children while the other wife would have lived next door. (Polygamy is now illegal in Morocco). 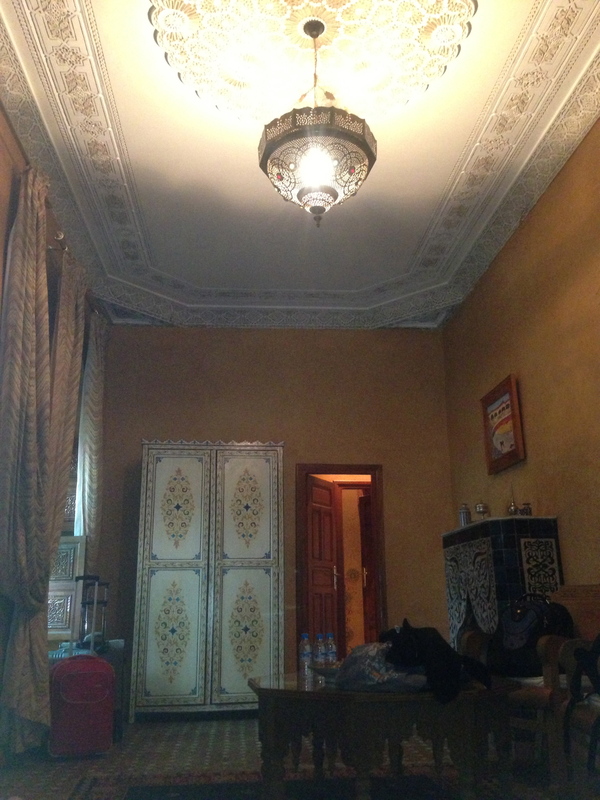 We relaxed and sipped our tea until Youseff led us to our room. We felt like royalty when we entered. Our quarters were spacious with plenty of room to relax. The windows had colored glass and views of the courtyard and when opened allowed the peaceful sounds of the fountain to relax us. Our bathroom was large with a tub that was definitely not for those lacking in agility. There was a thigh high mosaic wall to climb over to enjoy an open air shower. Youseff left us to rest. Notice the shiny plaster on the walls. This is called Tadelakt plaster which is created using lime plaster that is treated with a natural soap. Sky and Savannah played on their new rubberband looms creating bracelets and little animals (thanks Dave!). 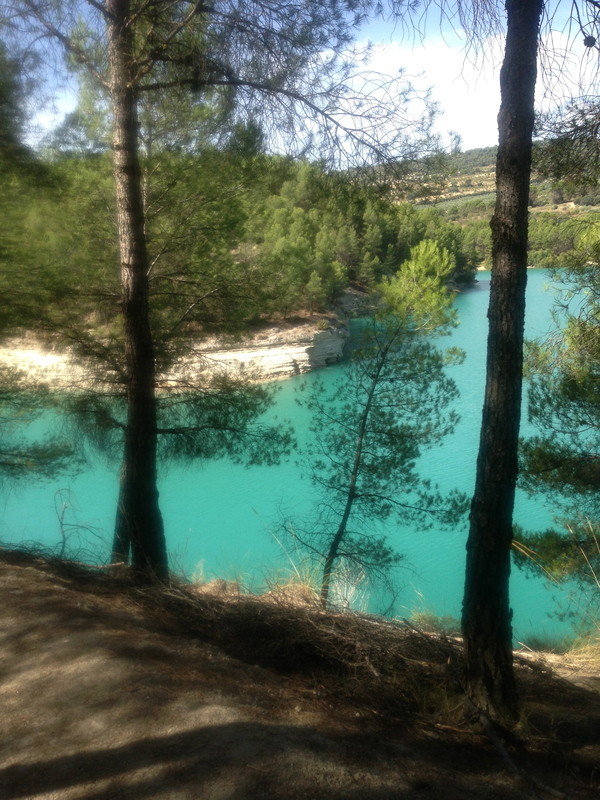 We enjoyed the cool peaceful tranquility until our stomachs reminded us that we needed to go out. 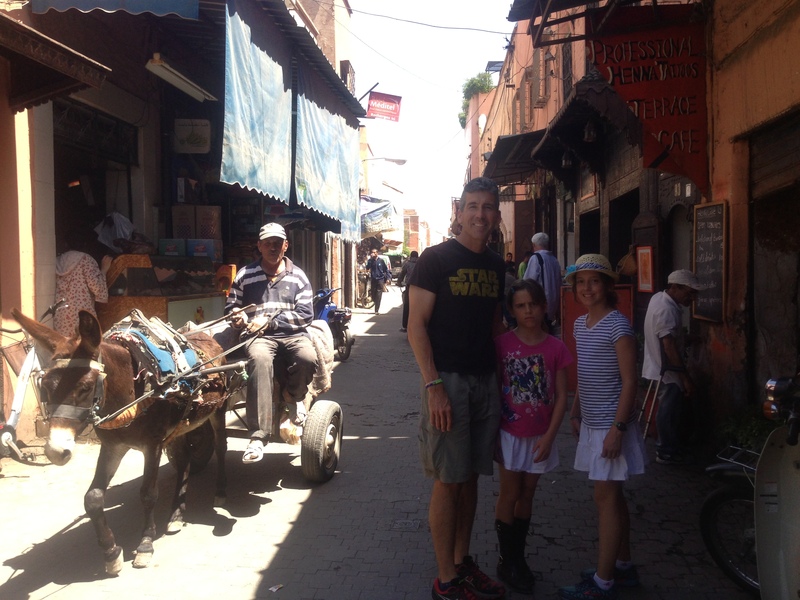 Youseff walked through a short maze of passageways to a busier road deeper in the medina. The medina is the area within the rampart walls, it is a maze of narrow cobblestone streets with thick walled interlocked homes. This labyrinth was supposedly designed to confuse invaders. We learned that it also functions to confuse modern day tourists. The narrow passages were quite obviously created for pedestrian and animal traffic but today they are a dangerous mess of foot, donkey and scooter mayhem. We had to be constantly alert as scooters flew by the winding, tight roads. Youseff pointed out small landmarks so that we could find our way home. He launched us in the direction of good eats and disappeared. We wandered down the road, conscious that we looked conspicuously foreign. Although we were careful to dress respectfully the first day (the picture above is from later in the trip), we realized that short of wearing headscarves there wasn’t much that would help us blend in. We stumbled upon a lovely restaurant called Kremm Café. 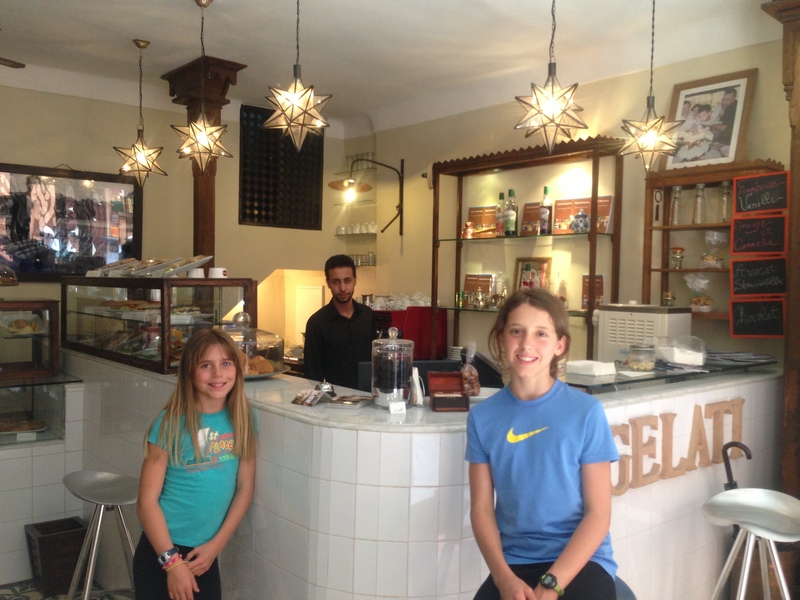 After months in Spain we were excited to try some Moroccan food. 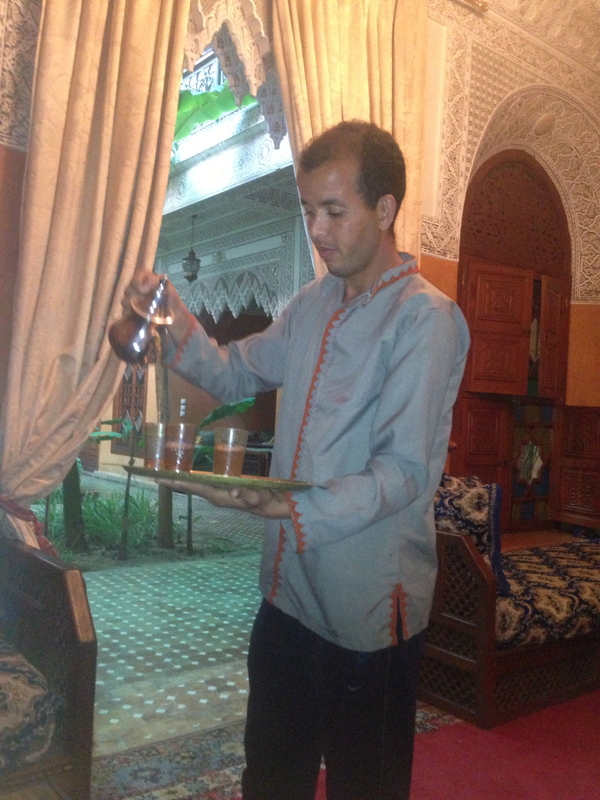 The typical Moroccan dish is a tagine, an earthenware pot which is traditionally heated over hot coals. All of the ingredients are placed in the dish and are cooked slowly over many hours. Mike and Savannah discovered what would be their favorite food right away, lemon chicken tagine. The chicken, lemons, olives, onions, oil and spices are placed in the middle of the pot and vegetables are arranged in a pyramid over the meat. Sky and I enjoyed many vegetable tagines which are the same design minus the meat. Cous cous is offered as a side dish with the juices from the tagine poured over it for flavor. We were not brave enough to eat from one of the street vendors but it did smell good. This picture is from Wikipedia. 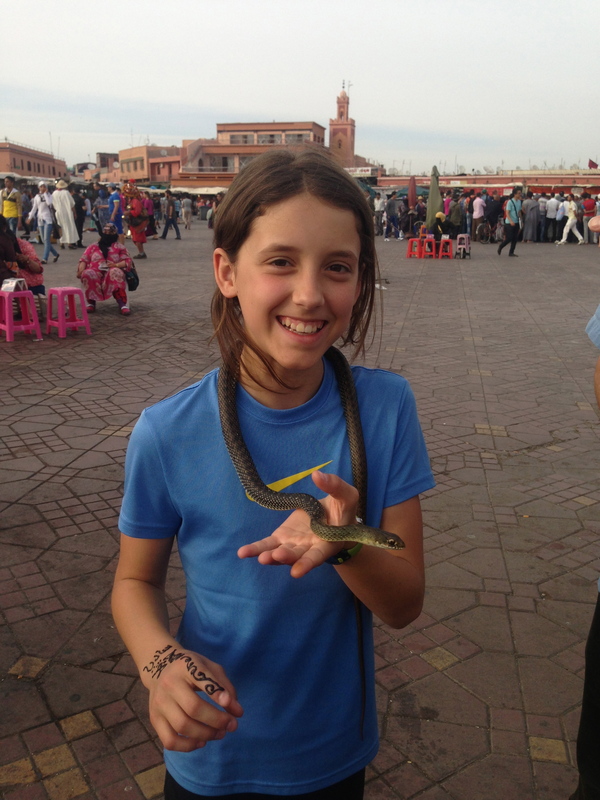 Marrakech is teaming with tourists. We felt foreign but we had plenty of company. We felt a bit more comfortable amongst the European tourists who were dressed for the weather in sundresses and tank tops. We soon gave up on wearing long pants and long sleeves. After lunch we set out to discover the famous Djemaa el-Fna square. This is a huge open air market. Djemaa el-Fna is both a functional marketplace where the locals come to shop and a major tourist trap. The main entrance is lined with horse drawn carriages and men with crazy hats trying to lure visitors on a tour around the medina. The idea of the big square was more exotic than the reality. “Henna” artists swarmed us as we approached . One young man grabbed Sky’s arm and started painting a “free sample” he said. Beware of black Henna, Sky still has a rash! When he was done with a quick doodle he demanded 100 dirhams, (which he did not get). It turned out that her henna tattoo was not henna at all but an irritating black ink. Weeks later, Sky still has a rash. 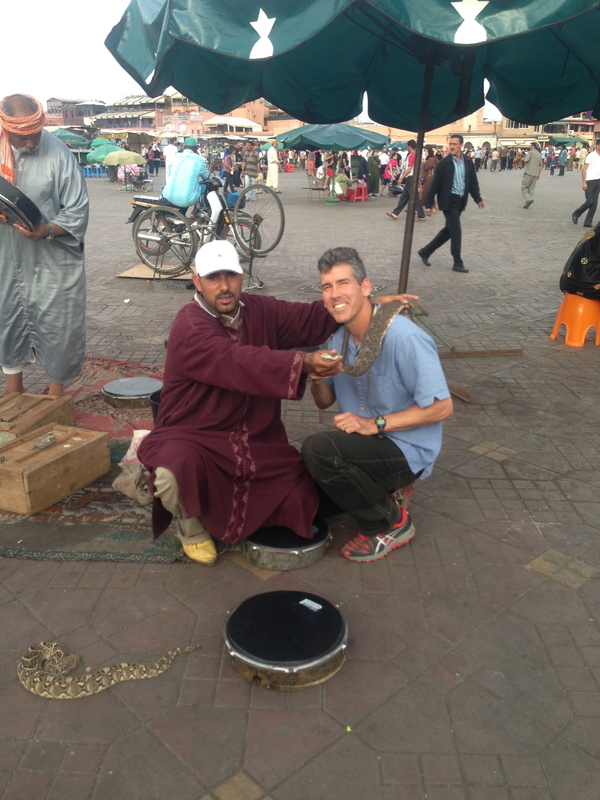 Next up were the snake charmers who were friendly and welcoming at first. 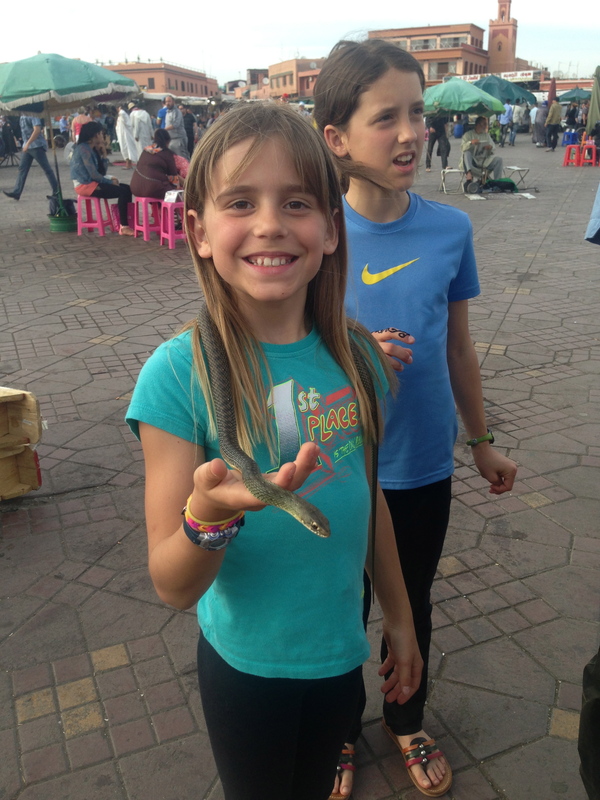 One man draped a harmless, lethargic, green snake around our necks, “for luck”. He led Mike over to his tent where he pulled a viper out of a basket. He held it over Mike’s shoulder for a picture. When I looked at the picture later I noticed that it was flat and quite possibly dead. We took pictures knowing that we would be expected to pay him. I offered him 20 dirhams (about 3$) which I thought was fair for a couple of photos. His demeanor changed quickly and suddenly he was angry demanding 200 dirhams (23$). In the end I gave him a little more and we walked away. Whew, not the magical experience I had hoped we would find. There were dried-out lizards and turtles in cages baking in the sun. Unhappy monkeys in chains were led around by evil looking handlers. As soon as we got close to the monkeys I felt bad that we were encouraging this practice by being there at all. The monkeys looked at us with sad, intelligent eyes. It was a circus of unkind, seedy performers exploiting the animals and tourists alike. They began with toothy smiles but were quick to change from friendly to demanding in a blink of an eye. 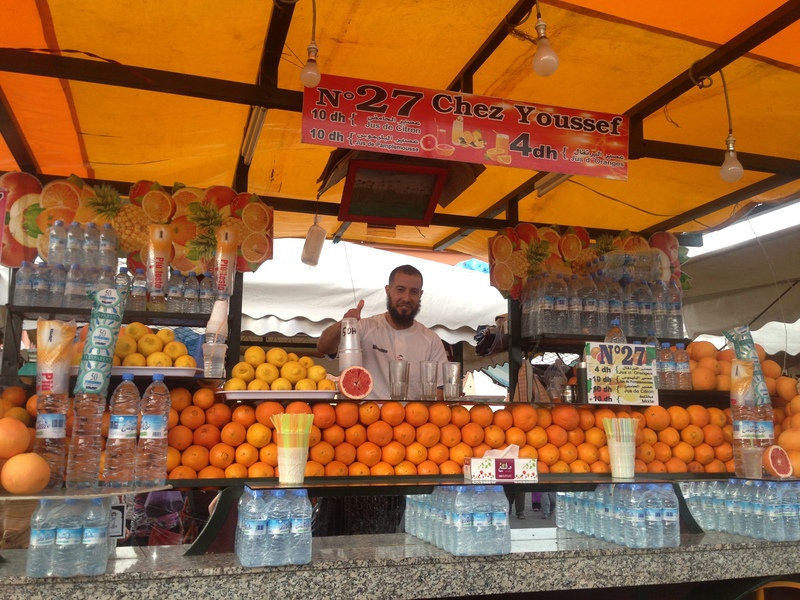 We did enjoy the fresh squeezed orange juice from one of the many juice vendors. Don’t forget to come back to stand 27! Eventually we retreated to a rooftop cafe to observe the chaos below. Djemaa el-Fna is today at best a flee market or carnival, at worst a lure to see how much money they can bleed from the tourists for a few pictures and trinkets. Long ago it was a very different place. Djemaa means “meeting place” or “congregational mosque”. Fna or Fina can mean either “death”, “end” or “courtyard”. So Djemaa el-Fna either means Mosque with a courtyard or Meeting place of death. There is a famous Mosque in front of the square called the Koutoubia Mosque but I also found references to the ancient practice where severed heads of criminals and sinners were displayed in the big square so either definition may be correct. No pictures of that! 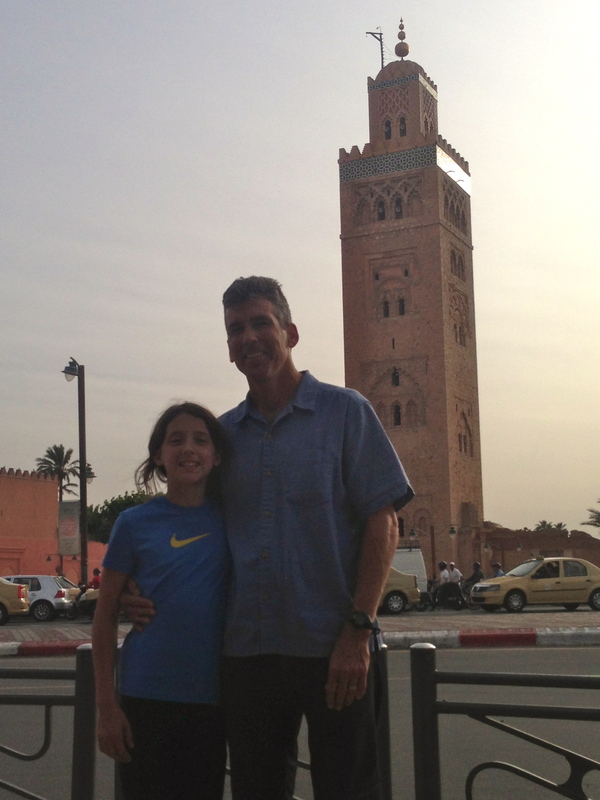 The Koutoubia Mosque is the largest mosque in Marrakech and the towering minaret (picture above) built around 1150 is the oldest of the 3 great Almohad minarets around the world. 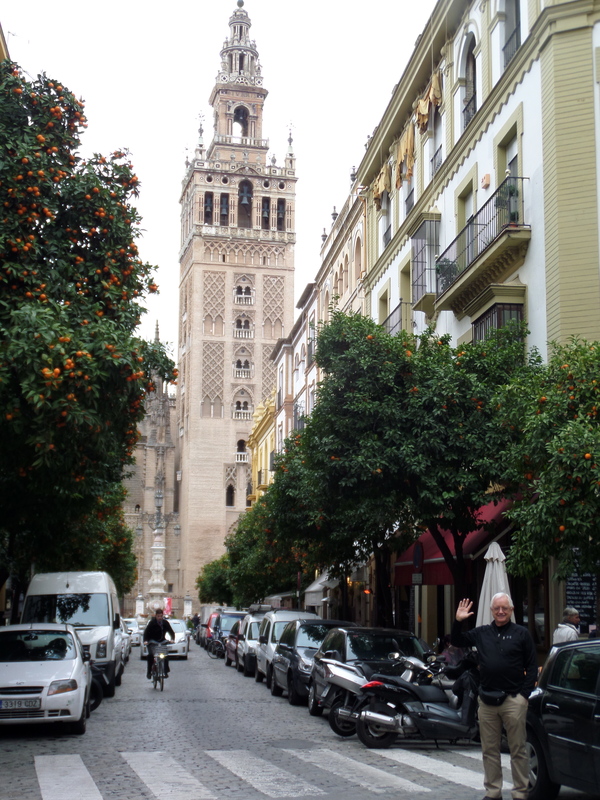 The others being the Hassan Tower in Rabat and the Giralda in Sevilla. And another, sorry I couldn’t resist because I have so many pictures of Sevilla. Note my Dad in the lower right hand corner! 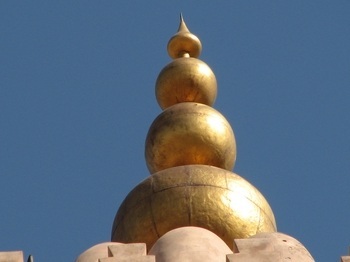 Interestingly the minaret of the Koutoubia Mosque is topped by 3 golden orbs. There are many legends regarding the orbs. 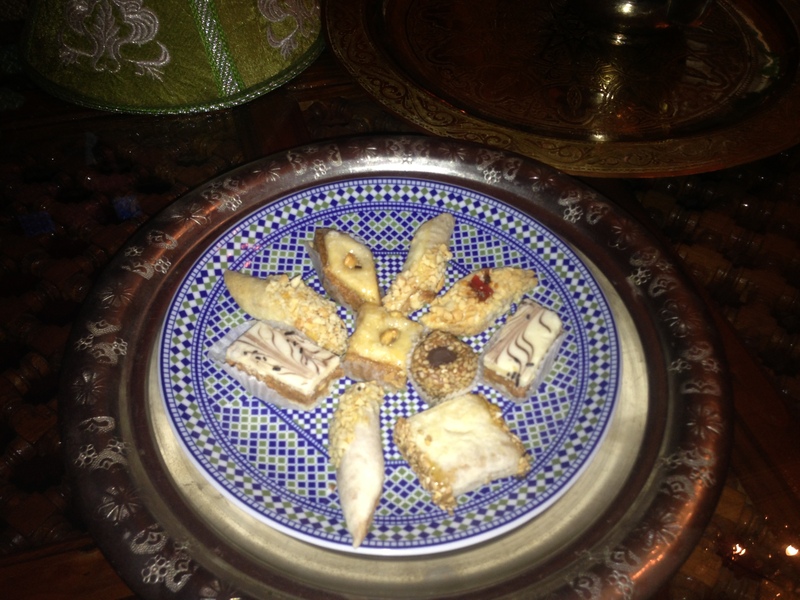 One of which is that they were made from the melted jewelry of Yaqoub al Mansour’s wife in penance for eating either 3 grapes or for eating during 3 days or 3 hours (depends on what you read) of the Ramadan fast. We couldn’t actually enter the mosque as we were quite obviously not muslim. After enjoying our break from the chaos in the square on the terrace with a light dinner (well, quite light, as it was very bad). 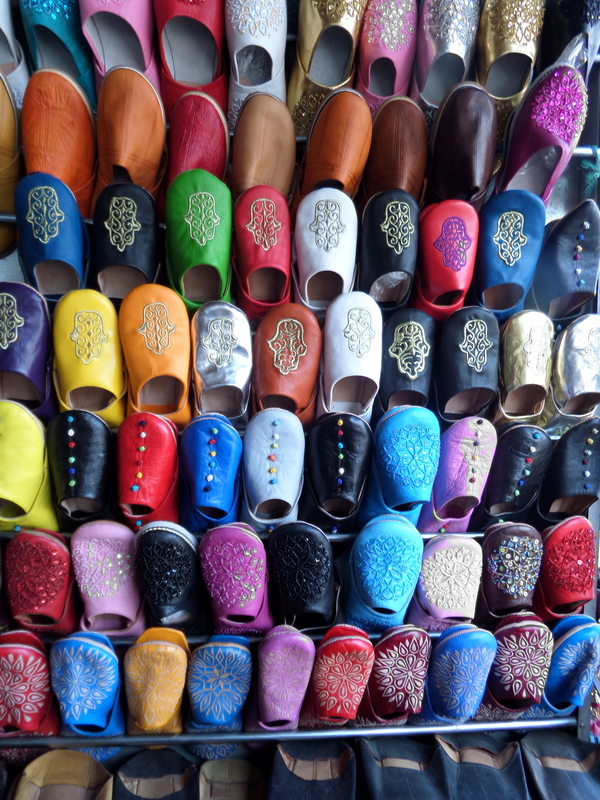 We ventured into the souks, the markets of the medina. 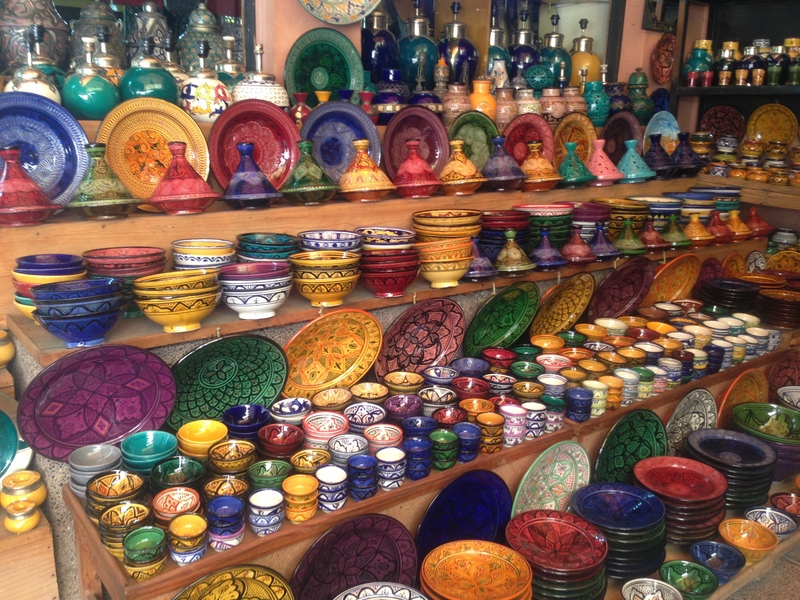 Part of the experience in the medina, it is said, is to get lost in the souks. Breathe in the smells, taste the food, buy some stuff that you never knew you needed. We dove in, visiting various shops. I bought some shoes and souvenirs. Sky bought some sandals from this nice man who showed us how he made them. Who knew I needed blue slippers! We could see the minaret and initially using that as a reference we thought that we could just walk in one direction and end up at the rampart wall and then walk until we came to our riad. Silly plan. The sun soon set and any chance of navigating using the minaret dissolved as everything above the walls of the labyrinth faded with the last light of the day. Nevertheless, I was enjoying the exotic sights and smells. There were tables piled high with dates, apricots, mint and herbs. Colorful stores lined the streets filled with leather shoes, scarves and pottery. There were carts with baskets of aromatic spices (would have been more appealing without the many flies). Vendors called to us as we walked inviting us to sample their foods or try on traditional flowing robes. The colors were intoxicating. I was fully enjoying the experience but as it grew darker and we tried to orient ourselves I became a bit nervous. Walking in one direction was actually impossible as every road twisted and turned almost imperceptibly until we were not sure which direction we were going. Deeper into the medina the shops became less touristy and the people more local. I had read that a compass would have been useful, I later remembered that my iPhone had a compass but I didn’t think of it at the time. The girls began to worry that their parents were lost and Savvy started to cry. Despite the dark alleyways, I never really felt unsafe. There were children playing around every corner and friendly locals stopped to offer directions. Just take the second left and then you will be on the correct street… Finally we stopped at a newsstand and the man directed us to a teenaged boy who offered to lead us home. I read that this is what everyone ends up doing when lost in the medina and since a taxi is not possible we followed the boy deeper into the tangle of passages. Soon we recognized a shop where we had bought ice cream earlier in the day and I paid the boy 100 dirhams (12$) which is what my tour book recommended. We were so relieved to be welcomed home by Youseff. He made us tea and by midnight we were asleep only 18 hours after we had left Spain! 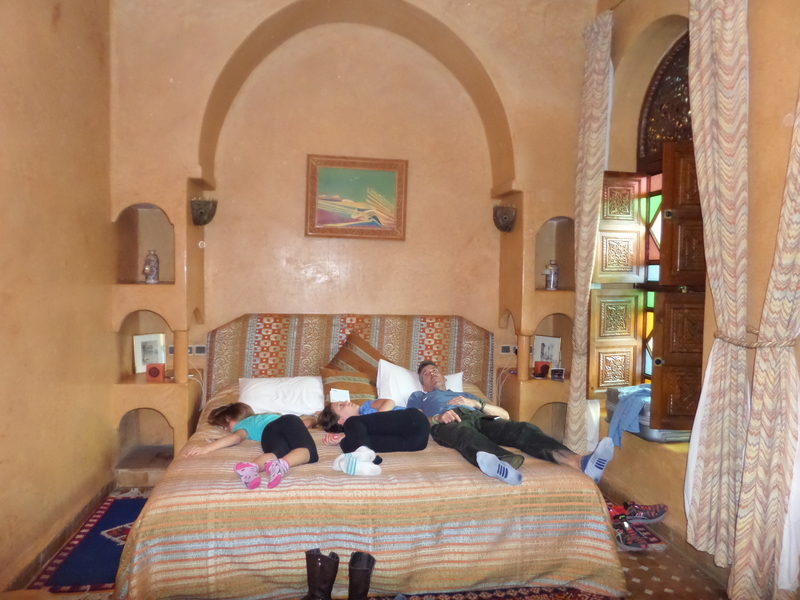 As I was tucking the girls into bed they asked how many days we had been in Morocco. I answered just one day but it already felt like 2 or 3. 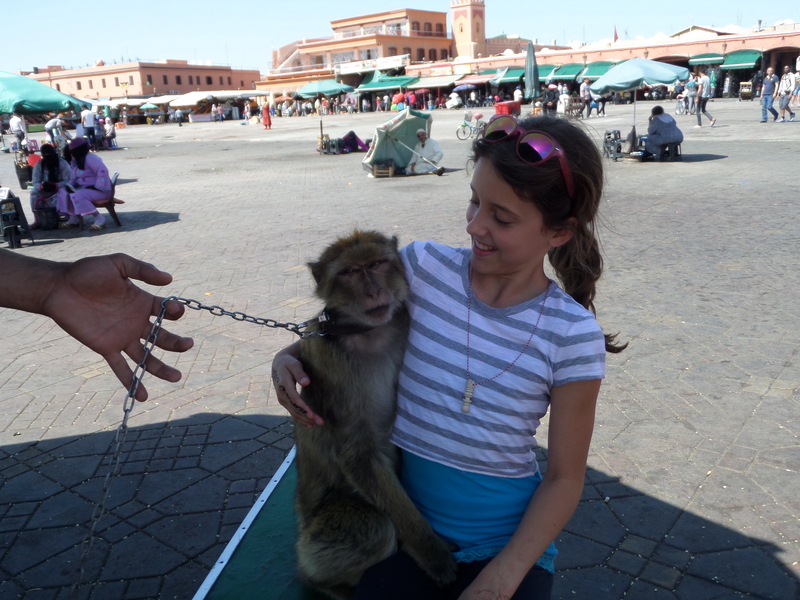 Stay tuned for Morocco part 2… Please send comments! I love to know who is reading this!